Hardly any verifiable documentary evidence has reached us concerning the twenty-year career of this artist, one of the most refined painters of 17th century Europe, apart from De Dominici's biography and a single date, 1645, found on Cavallino's only dated work, the Saint Cecilia, from the Neapolitan church of Sant'Antonio delle Monache, now temporarily in storage in Palazzo Vecchio in Florence. De Dominici states that Cavallino learned his craft from Stanzione. 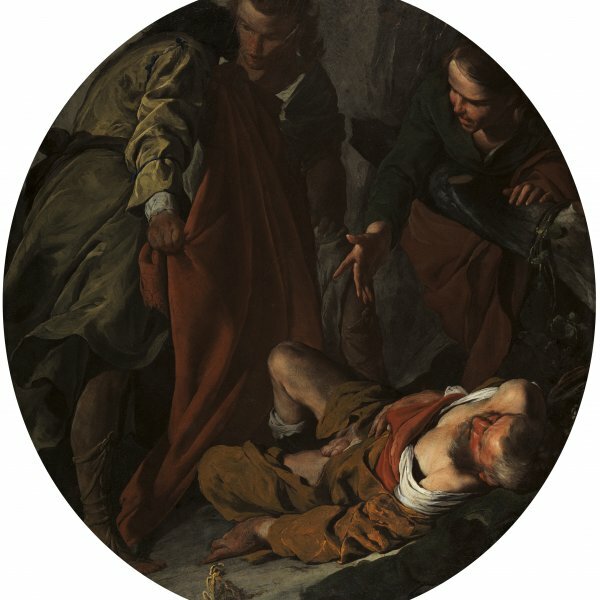 Contemporary criticism, however, is more convinced by a link with the vigorous, even ragged realism of the great anonymous Apulian or Spanish painter, the Master of the Annunciations to the Shepherds, whose Iberian style would better explain the influence of Velázquez that is sometimes evident in Cavallino's works. The difficulties that abound in any attempt to order, in a plausible manner, the many existing works, mostly of a smaller format, also make it difficult to accept without question earlier chronological suggestions. If one accepts as works of his youth those pictures with a more elusive organisation, fascinating in their strong chiaroscuro and barely marked by formal individuation, such as the Communion with the Apostles in a private collection in Milan, the Esther and Ahasuerus in the Istituto Suor Orsola Benincasa in Naples, and if one further assigns to the artist's early career, as work of a less dynamic Ribera, the Martyrdom of Saint Bartholomew in the Museo di Capodimonte, it still does not seem legitimate to insert a larger work like the Visitation of Anna and Joachim in the Szépmüvészeti Múzeum in Budapest into this chronology. The date of the Florentine Saint Cecilia suggests that Cavallino was in his thirties when he painted The Dream of Saint Joseph now in the Múzeum Narodowe in Warsaw, the Immaculate Conception in the Pinacoteca Brera, the Judith in Stockholm, as well as Christ Bearing the Cross in the Chrysler Museum in Norfolk, and the Adoration of the Shepherds in the Cleveland Museum of Art. Whereas virtually every work by Cavallino merits mention, it still seems useless to attempt to characterise all of his output in which he maintained levels of remarkable quality. Just as Ribera had ultimately taken a Titianesque and Van Dyckian turn, so this Neapolitan artist had, by this time, grafted onto his ever-present naturalistic roots the bright blues, greens, oranges and almost acid greens derived from the neo-Venetian tendencies of Flemish painters (above all Van Dyck), but also of the Genoese painters passing through Naples (such as il Grechetto). It is the alchemy he achieves with these elements that sets Cavallino apart from his Neapolitan contemporaries as well as his care in creating dynamic protagonists in scenes from the Old Testament, from Classical literature and from Tasso's poetry, for example, The Finding of Moses in Braunschweig, Mutius Scaevola before Porsenna in the Fort Worth Art Museum, and Erminia among the Shepherds in the Museo di Capodimonte. In his gallery of figures Cavallino's autonomous female figures are deservedly famous, above all his Singer in the Museo di Capodimonte-fully imbued with an already eighteenth century grace. Indeed, one is tempted to repeat what has in fact been written of Cavallino: that it was his fate to be born ahead of his time.